Brighton, CO - The Greater Brighton Chamber of Commerce has been chosen as a Small Business Saturday Neighborhood Champion through the American Express Shop Small campaign. This is an exciting opportunity for the Chamber as it gives us additional resources to share with our community to encourage local shopping and dining this holiday season. 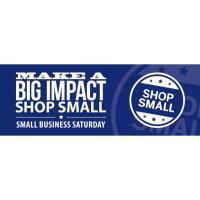 Small Business Saturday is about more than just shopping at small businesses. It's a cause that helps support our local economy and promote a unique, vibrant, and diverse community. Small Business Saturday is a nationwide movement fueled by shoppers, business owners, and organizers who come together and celebrate the community because they know it matters. Small businesses play a key role in helping Brighton thrive. By shopping or dining at your favorite local places throughout the year, you're showing your support for small businesses and making a positive impact in your community. To launch Small Business Saturday please join us at our Small Business Saturday Kickoff Party on Saturday, November 24th at Main Street Café (161 N Main St, Brighton, CO 80601) from 8:00 a.m. - 10:30 a.m. The Mayor of Brighton will be present to read his official proclamation of Small Business Saturday and our President/CEO, Naomi Colwell will discuss the impact Small Business Saturday has on our community. We will provide breakfast snacks, giveaways, music, face painting for the kids. Pick up a passport and shop or dine at over 20+ Brighton participating businesses. Collect stamps and be entered to win great prizes. We will host a Small Business Saturday block party featuring your favorite retailers, restaurants, and bars in Downtown Brighton on Main Street. We will be featuring three Welcome Stations around Brighton; Main Street Café (Downtown Brighton), SOFX: Soul on Fire Xercise (Prairie Center), and South Philly Cheese Steaks (Brighton Pavilions). Bring your family along for a fun day of shopping, dining, and fun! We are pleased to announce this special event is brought to you by the partnership of Discover Brighton, the Downtown Partnership Committee, Brighton Economic Development, and the City of Brighton. How can you get involved? If you are a local business please reach out to us with information on any deals or special activities you have planned! We want to ensure our Shop Small Campaign is a huge success. Large businesses can also get involved by supporting your community and sponsoring the shop local movement. And each and every one of us can support our local businesses by shopping local throughout the holiday season. Check our website www.BrightonChamber.com frequently as we will continue to add retail and business partners to the list of participants, and be sure to look out for special sales, deals, and promotions that many of the retailers will be offering. We look forward to seeing everyone shopping local in Brighton! Keep an eye out for more details about our Brighton Small Business Saturday event plans in the coming weeks. Brighton Economic Development Corporation (BEDC) is a 501c (6) Colorado non-profit organization serving the Greater Brighton Area. BEDC is the primary agent for economic development services. BEDC offers relocation, retention and expansion assistance and support to businesses. BEDC works to expand and diversify the local tax base by facilitating the creation of quality jobs and the attraction of retail development. BEDC encourages responsible, diverse growth and development that enhances Brighton's quality of life as a desirable place to live, work, learn and play. The original business district for the City of Brighton. Check out what is new on Main Street, plenty to do for the entire family. Founded in 1887, Brighton, Colorado is located 20 miles northeast of downtown Denver and is home to a diverse population of approximately 39,000 residents. To learn more about Brighton, visit www.brightonco.gov.